Starbucks' Caramel Macchiato -- with its crosshatch of caramel sauce, signature "mark" of espresso on top, and subtle vanilla flavors -- has long been among the coffee giant's most popular drinks. 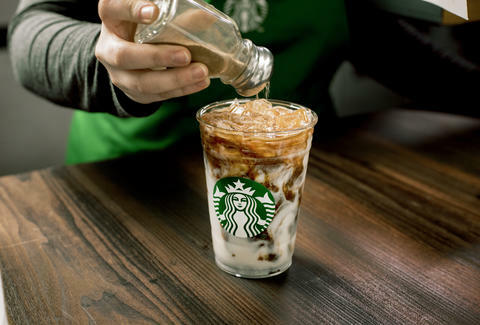 Now, Starbucks is launching two fresh takes on the classic beverage to match the changing weather of spring: the Iced Cinnamon Almondmilk Macchiato and the Coconutmilk Mocha Macchiato. Starbucks revealed the new macchiato drinks on Monday, saying one is designed to complement the season's warm and sunny days while the other is meant to warm you up when the forecast calls for cold and misery (take a wild guess at which is which). Both will hit Starbucks locations across the US and Canada on February 28, but will be available for only a limited time. The Iced Cinnamon Almondmilk Macchiato is made by pouring shots of espresso over almond milk and cinnamon dolce syrup, then it's topped with a crosshatch of caramel sauce and a dusting of cinnamon dolce sprinkles. 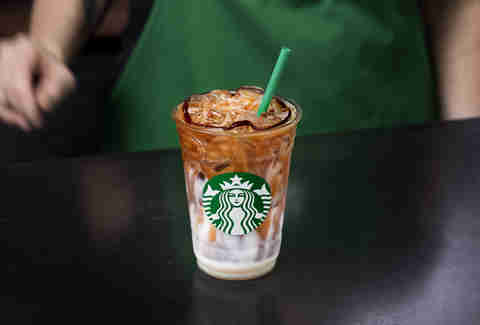 Starbucks said the beverage was inspired by horchata drinks that popular in Spain and Latin America and recommends it for sunny spring days. As for the Coconutmilk Mocha Macchiato, Starbucks recommends the hot drink for sweater weather, although you can get it iced as well (shown above). Baristas make the drink by pouring espresso shots over steamed coconut milk that's flavored with a hint of white chocolate mocha sauce. A crosshatch of caramel sauce and a swirl of mocha sauce on top results in a gorgeous five-layer drink that's basically made for Instagram. Look out, Rainbow Drinks. Best of all, the launch of the new drinks coincides with a "Meet for Macchiatos" buy-one-get-one (BOGO) deal. Buy any size macchiato drink (hot or iced) between 2pm and 5pm on March 2 through March 6 and Starbucks will throw in another one for free at participating locations. So, if you're torn between which of the new drinks to try, well, you know what to do, folks. Tony Merevick is Cities News Editor at Thrillist and is surprised by the prominent use of dairy-free milks here. Send news tips to news@thrillist.com and follow him on Twitter @tonymerevick.